The history of St. Drostan is not quite clear. He seems to have been a Celtic monk living in Scotland, in the sixth century A.D. His name appears at a few different places, and his life story seems to be a mixture of the lives of two different legendary monks. He was also known as St Drust, Trust, Throstan or Drostán mac Coscreig of Deer. He was apparently the son of royal family, and became the pupil of St. Columba or Columcille. Together they landed at Aberdour in Aberdeenshire around 575 A.D. 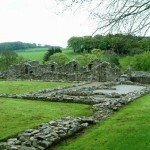 They founded a monastery near there in Deer (or Deir), Pictland, Scotland. 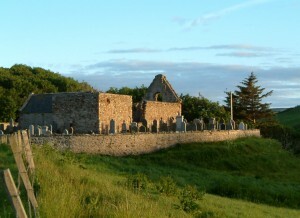 St. Columba eventually gave the town to Drostan, to travel on to Iona. Legend had, that on their departure, Drostan shed tears (Deara in Gaelic), which inspired Columcille to name the town Dear from then on. Drostan later became the abbot of Dalquhongale (Holywood), and eventually chose to become a hermit at Glenesk until his death. This is where the miracles ascribed to him took place, such as restoring sight to a priest. Drostan’s remains were buried died in the (old) abbey in Deer, around 606 A.D. Later, in 1213 or 1219, a second Cistercian abbey was erected in New Deer, in favour of the one Drostan founded with St. Columcille. A different account says he was the son of the prince of Demetia (the Demetae), now part of South Wales. One His sister was mother of Aedhan, who was crowned king of the Dalriadic Scots by Colum Cille (against the will of the people, Scotish law and custom, the and rights of Duncan or Donnchadh). He became a monk, perhaps to escape his family, and travelled to Aberdour around 520 A.D. 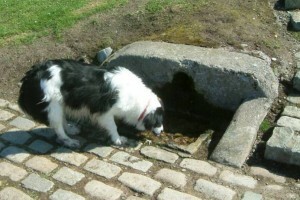 He had three followrs, Saints Colm (or Colman), Medan and Fergus. St. Colm might have been consider St. Columcille in this version, but Colum Cille would not have been able to speak the local language. And… in yet another version, St. Columba was St. Drostan’s uncle. The “Breviary of Aberdeen” apparently celebrates his feast on 15 December. According to the Mystical calendar, 11 July is the day of the unsollicited opinion, to honor St. Drostan. Many thanks to Stanley Bruce (Principal Surveyor at DNV Energy), who dropped me these lines in May 2007: “Came across your website re St Drostan, Would you like some pictures to go with it?”. Yes! The images are smaller versions of the photos he sent me. Thanks, Stanley! There is a description of Drostan’s life in the Breviary Aberdonense, a collection of tales about Scottish saints, compiled by Bishop William Elphinstone, first published around 1509. Here, the existing legend of Drostan from Buchan or Aberdour was probably mixed with another legend from Angus. As a result, he was an Irish monk that both lived a hermit life in Glenesk and worked on the conversion of Scotland. Aberlour Glenlivet Distillery. On the grounds of this distillery is a granite stone that supposedly marks the source of St. Drostan’s Well, in a beautiful valley along the river Spey. In ancient times, a small druid community settled here. The name Aberlour comes from the Gaelic translation of “Mouth of the Chattering Burn”. The water of this St. Drostan’s Well is an important ingredient of Aberlour Pure Single Highland Malt Whisky, one of the finest among the Speyside whiskies (note: I am slightly biased after an unconventional tour of the distillery, with the only tasting session where we got some other Speyside brands to compare). The Aberlour distillery was established in 1879 by James Fleming, who lived up to his family motto “Let the deed show”.